The EF 300mm f/2.8 L IS II USM features 3 image stabilization (IS) modes. Apart from Mode 1 and 2 which deals with engaging the IS and detection of any panning movements respectively to disengage IS, the third mode engages the stabilization system only when the shutter button is fully pressed. This incredible 300mm tele lens benefits from the three IS modes to give sharp images in all lighting conditions. Canon has provided fluorite elements in the lens which ensures that the lens has a much suppressed effect from chromatic aberrations. The presence of other multiple coating addresses the problems of lens flare and ghosting. There is also a fluorine coating that directly takes care of smearing and finger printing problems. For a tele-lens the presence of image stabilization is an absolutely imperative requirement. Canon has ensured that the lens has up to four stops of stabilization which allows the lens to be used for hand-held shots up to four stops slower shutter speed. The lens construction has a total of 16 elements arranged in 12 groups. The presence of inner focusing system means the lens does not extend when focusing. The diagonal angle of view of the lens is 8° 15′ and its closest focusing distance is 6.6’ or 2 meters giving a maximum magnification of 0.18x. The diaphragm of the lens is made up of 9 rounded blades. The external dimensions of the lens are 5.0” x 9.8” while it weighs 2350 grams. The lens uses a drop in filter of 52mm. Also check Canon Ef 300 f/4L IS. 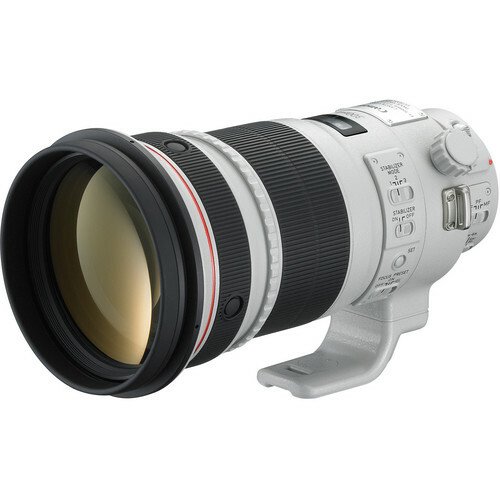 London, UK, 26 August 2010 – Canon today enhances its premium L-series with the launch of the new EF 300mm f/2.8L IS II USM and EF 400mm f/2.8L IS II USM – two high quality super-telephoto lenses designed to meet the demands of professional photographers. Offering optical excellence and consistently high performance, the new lenses combine super-telephoto focal lengths, fast aperture and outstanding image quality, providing photographers with reliability and exceptional results. Succeeding the well-respected EF 300mm f/2.8L IS USM and the EF 400mm f/2.8L IS USM , both new models will appeal to nature, wildlife and sports photographers. Each features a completely redesigned optical system and the latest iteration of Canon’s original Image Stabilizer (IS) technology, while an all-new magnesium alloy construction and titanium components ensure the designs are both robust and lightweight. The EF 400mm f/2.8L IS II USM is the lightest lens in its class¹, offering unrivalled mobility due to an incredible 28% reduction in weight (1.5KG) compared to its predecessor, while the EF 300mm f/2.8L IS II USM offers photographers an 8% weight reduction. Developed in line with Canon’s philosophy for the elite L-series, both the EF 300mm f/2.8L IS II USM and EF 400mm f/2.8L IS II USM boast a refined design that reflects their status as market-leading, benchmark lenses. Both feature a new design layout, with carefully-positioned controls that improve operation in everyday use. The AF stop buttons are now location-adjustable, improving ergonomics by allowing users to custom-select the position of the lens grip, where the AF stop buttons are located. Both new models are compatible with the new set of Canon lens extenders designed for L-series super-telephoto lenses – the Extender EF 1.4x III and Extender EF2x III . Manufactured to complement the new optical systems featured in both lenses, the Extender EF 1.4x III and Extender EF2x III will allow professionals to instantly extend the focal length of either lens by 1.4x or 2x respectively – enabling the capture of high quality, detailed images of subjects that may typically be beyond reach. ¹ As of August 2010.